Summer south-west monsoon winds heralded the start of the Hebe Haven Yacht Club Typhoon Series in Hong Kong on Sunday June 2. Fifty boats signed on for this important series in the Hong Kong Yachting calendar. 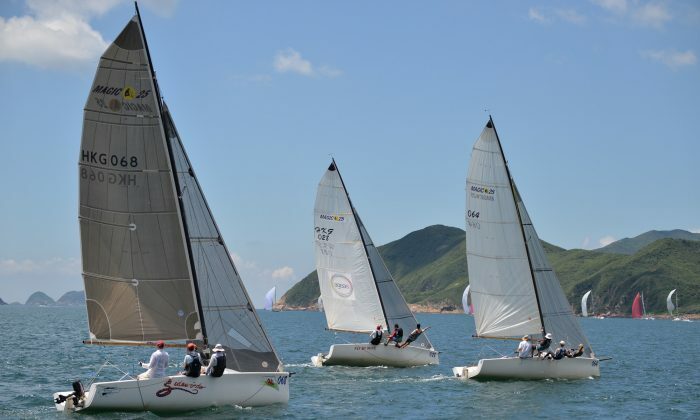 Although some boats, notably Jelik, Freefire, Foxy Lady, Elektra and EFG Mandrake, were away at the Koh Samui Regatta in Thailand (which finished on Saturday June 1), the Typhoon Series still attracted many of Hong Kong’s big performers. This Islands Race was a good start to the 9-race series in ideal weather conditions—a nice breeze at the start in Port Shelter with stronger winds out beyond the Islands. Four Island courses were selected to cover the five Divisions, IRC-A, B and C; HKPN and Sports Boats. Signal 8, Ambush and Outrageous took the first three places, respectively, in this lead division, with Sea Wolf, Krampus and Mojito taking the next three places. Taking a longer, more demanding course, five boats retired from the race with technical and rigging problems. There were 18 boats in this divisional race, with old friend Vixen taking line honours, but on corrected time Whiskey Jack took the win with Red Kite II in second place. Vixen came third, followed by Rampage, GearBox and Dexter II. This division is essentially an Impala Division, which took the same course as HKPN, but started five minutes earlier. Impala 1 took line honours and first place on corrected time, with Taxi, Boss Hogg, Moll and Also Can taking the minor places. Bits & Pieces had an early afternoon finish after completing their race in under two hours, but a seven-minute advantage over Scintilla was not enough. Corrected times pushed Bits back to 11th place. Scintila, Windseeker, Dea II, GA and JeNa PaBe (Ben Chong) taking the first five places, respectively. Nine Sportsboats took part in this race, with Steve Bourne on Merlin just edging the win from Fly By Wire, with Catch 22 taking third spot. In Thailand’s Koh Samui Regatta, there was a slightly smaller turnout for the rally this year, with only 27 boats over five race categories, IRC-0, 1 and 2, Bareboats/Cruisers and Multi-hulls, compared with 32 last year. Frank Pong of Hong Kong won the IRC-0 in some style in Jelik taking the trophy with eight wins and a fifth place, with Sam Chan also of Hong Kong in Freefire 52 with all top three finishes. Ben Copley of Australia with Katsu came in third, Mohamad Razali Mansor was fourth with Miri Marina Uranus, with Geoff Hill’s Antipodes bringing up the rear. Bill Bremner from Hong Kong with Foxy Lady took regatta honours, Marcel Liedts, also from Hong Kong, with Electra came second. While Singapore boats Walawala 2 and Windsikher were placed third and fourth, respectively, and EFG Mandrake took fifth place. Australian Matt Allen won all races in this class on Ichi Ban, while Gary Baguley of Thailand on El Coyote came second. Nicholas Smith took Cruiser honours with Free Wind. Mike Grower’s Moon Shadow came second and Patinyakorn Buranrom came in third with Sansiri. There were only three Multi-hulls that took part, with a petulant Crazy Horse not starting in six of the races. The Mulit-hull placings were won by boats from Thailand. David Liddell on Miss Saigon won, with Henry Kaye coming second on Sweet Chariot. The next Hebe Haven event is Race Day-2 of the Summer Saturday Series on this coming Saturday June 8. The Aberdeen Boat Club’s Summer Series starts on Sunday June 9.